On April 15, 2019, Notre Dame caught on fire. I am writing this as it is happening, and the roof is completely engulfed in flames—and now the spire just collaped into the church. Clearly this magnificent monument will be closed for some time to come. I will update as soon as I can (and when I have recovered enough to write about it sensibly). "Our Lady of Paris" is the heart and soul of the city, a monument to Paris' past slung in the cradle of the city's origins. The cathedral, built between the 12th and 14th centuries on one of the islands in the middle of the Seine River, is a study in gothic and gargoyles, at once solid with squat, square facade towers, and graceful with flying buttresses around the sides. It's been remodeled, embellished, ransacked, and restored so often that it's a wonder it still has any architectural integrity at all (during the Revolution, it was even stripped of its religion and re-christened the Temple of Reason). Today you're more likely to run into long entry lines than Quasimodo, but at least while you wait to get in you have time to admire the Bible stories played out in intricate stone relief around the three great portals on the facade. Much of the facade was (poorly) restored once in the 18th century, and then again (as well as could be done) in the 19th. If you're keen to see some medieval originals, the upper tier of the central portal is ancient, and much of the sculpture on the right-hand portal has also survived from 1165-75. In the high, airy gothic interior, the choir section has a gorgeously carved and painted stone chancel screen from the 14th century on its outer flanks, and 18th-century wooden choir stalls along the inside. The main draw, though, are the three enormous rose windows, especially the 69-foot diameter north window, which has retained almost all of its original 13th-century stained glass. Save Notre Dame for a sunny day and the best light effects. One last thing you shouldn't forget to do is simply to walk around the thing. Those famous flying buttresses at the very back, holding up the apse with 50-foot spans of stone strength, are particularly impressive. Cross the Seine to admire the entire effect from the quai on the Left Bank. At the opposite end of the square from the cathedral, a flight of steps leads down to the Archeological Crypt. Soaring vaults, flying buttresses, intricate stonework, and shimmering expanses of stained-glass. These iconic characteristics form some of the most striking aspects of the medieval Gothic style, which served as a driving force behind new architectural innovations. From understanding the basic aspects of the pointed arch to the typical Latin cross floor plan, our 3-hour Notre Dame tour will unveil the tenets of this architectural style. Heading to Île de la Cité, the city's central island, we'll encounter the principal masterpieces of Gothic Paris: the famous Notre-Dame cathedral, the Sainte Chapelle, and the Conciergerie—the only remnant of the Medieval palace of the Kings. With these quintessential examples as our visual textbook, we will voyage through the evolution of French Gothic art and architecture with a medievalist or art historian to guide the way. Small group of six people max. Notre Dame tour led by a medievalist or art historian. Includes Sainte Chapelle and Notre Dame. Born in 1144 at Saint-Denis just north of Paris (also the subject of our Saint Denis Tour, Gothic became thearchitectural style of Europe for the next four centuries. Fittingly, the Gothic wonder of Paris is—of course—the Cathédral Notre-Dame. Commissioned by Bishop Sully in 1160 with the aim of building the largest church in Europe, Notre-Dame showcases the development of Gothic architecture over its first hundred years. During our visit to this stunning site, our docent will help us unravel the elaborate symbolism of Notre-Dame's sculptural decoration, understand the development of the rose windows, and trace the evolution of the Gothic style. Our visit to the interior will be followed by an exterior tour of the iconic gargoyles and slender flying buttresses that represent the height of medieval engineering. 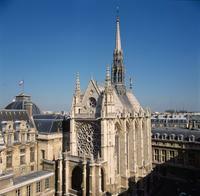 We will also visit another Gothic gem of the Île de la Cité: La Sainte Chapelle. With its unified composition of architecture, stained glass, painting, and sculpture, this magnificent chapel still takes your breath away. Built in just three years as the personal chapel of King Louis IX to house the holiest relics of Christianity, it is an impressive example of Rayonnant, or third-generation Gothic. Boasting towering thirteenth-century windows and a stunning fifteenth-century rose window, the Sainte-Chapelle is one of the most intact medieval monuments in Europe. Our docent will spend considerable time on St. Chapelle, going over its design and architecture; however, due to strict rules prohibiting group lecturing in the upper part of the chapel, we will do most of our discussion of Sainte-Chapelle from the exterior before immersing ourselves in the interior spaces. King Louis IX's chapel was but a small portion of the sprawling palace built by the medieval kings at the tip of the Île de la Cité, and we will further explore the vestiges of this former residence at the neighboring Conciergerie. Here, we will focus on the impressive feast hall designed for the royal guard. This hall could hold the palace’s entire 2,000-member staff, and is the largest surviving Gothic hall in Europe. Despite being abandoned as a royal residence after 1357, the Conciergerie went on to play an important role in the history of French justice. Time permitting, we may take a break from the Middle Ages with a brief visit of what was the prison building where Marie Antoinette and countless others were held before being sent to the guillotine (discussed further on our French Revolution Tour Paris). "Our docent shared insights from her professional background which heightened our appreciation not only for the beauty, but also for the technological achievements of the edifice. She presented everything with a sensitivity regarding the significant religious environment. An incredibly worthwhile tour." As our time together comes to a close, we will come away from the walk with a clear understanding of the main characteristics of Gothic Architecture and be able to identify them. We will also have a basic sense of the major landmarks of the Île de la Cité, once the epicenter of Medieval Paris. Our newfound knowledge will be enhanced by a familiarity with the role that Notre-Dame, the Sainte-Chapelle, and the Conciergerie played as representatives of religious and secular authority in France's medieval capital. Gargoyles, stained glass, flying buttresses—nothing symbolizes the mysterious air of Gothic Paris like the Notre Dame Cathedral. Paris' mother church symbolizes the medieval era like no other, evoking Arthurian legends, castles, and a seemingly mythical past. That past, however, is very real, and there are few better places to learn about the Gothic, especially its iconic architecture, than on the Île de la Cité. This small island in the city's center is home not only to Notre Dame, but also to several other architectural masterpieces we will visit on our 2.5-hour Notre Dame for Kids tour on which, in the company of an historian gifted with children, we will bring the Gothic to life. Family-friendly tour introducing children to the Gothic period, especially its revolutionary architecture. Notre Dame for kids tour led by a scholar trained to work with children. Incorporates interactive activities to foster learning in a fun and engaging way. Why are the gargoyles so spooky? Why are they there? Was there really a hunchback of Notre Dame? Starting with the iconic Cathédral Notre Dame, we will answer our young visitors' questions and more. As we explore the Cathedral's intricately carved decorations—its bizarre-looking buttresses and statuary—we will discuss the birth of the Gothic and set the stage for our walk. We'll look at the many changes the cathedral has undergone through different historical events—even paying special attention to the French Revolution and the restoration that made the building what we see today. Bidding goodbye to our gargoyle friends, we'll continue to the Sainte-Chapelle. Widely known for its "jewel box" stained windows, Sainte-Chapelle is a masterpiece of Gothic art. Built to house holy relics, Sainte-Chapelle's extraordinary stained glass windows offer an excellent opportunity to learn how stained glass was made and what purpose it served in the Gothic era. Could the glass be telling a story? In order to maintain the sacredness of the chapel, strict rules prohibit group lecturing in the upper part of the chapel, so we will do most of our structured discussion of Sainte-Chapelle from the exterior before immersing ourselves in the beauty of the interior spaces. We will finish with a visit to the Conciergerie, the residence of France's early royal family that later became an infamous prison during the Revolution (Marie-Antoinette was detained here prior to her execution, a story we examine further on our French Revolution Tour Paris). Here, we might discuss such topics as the life of the nobility versus the commoners—can you imagine what it might have been like to grow up in the 11th century? We'll certainly introduce some of France's most notorious royal characters. "[Our docent] did a great job engaging my young children, sometimes even sitting on the floor and drawing illustrations to help them identify components of the architecture we were seeing. He also did a great job balancing the information for the younger children, and then also giving information on the adult level to my husband and I and our teenage son." Designed with kids (and their enthusiastic parents) in mind, we select docents who are especially gifted with children. They will cater the walk to suit the age of the participants, getting a little more sophisticated with children above 12. As our walk comes to a close, our young participants will have the foundation for understanding the Gothic and, hopefully, the inspiration to continue exploring independently at home. In addition to our family program tours (including offerings like our Louvre for Kids Tour and Versailles for Kids Tour, we may be able to adapt certain other tours to the needs of families, though please note such adaptations would not incorporate special activities. Please contact us for more details. Skip the line to climb the Notre Dame Cathedral Bell Towers and explore 2000 years of tumultuous Parisian history from the dark ages to the City of Light. By booking ahead, you won't waste any time waiting in line! Numbers are limited to a maximum of 25 people on this small group walking tour, ensuring you'll receive personalized attention from your guide. Upgrade your ticket for a private tour exclusive to just your group. At Notre Dame Cathedral you will not only visit the interior of the church, but will also have the opportunity to climb the famous bell towers for astounding views of Paris alongside the gargoyles that have protected the Notre Dame for centuries. Your small group tour begins with a fascinating walking tour of the famous Ile de la Cité, in the heart of the Seine River, home to kings, revolutionaries and those famous gargoyles. Here you will see why Victor Hugo selected Notre Dame as the setting for his widely acclaimed novel, The Hunchback of Notre Dame. The flying buttresses, menacing gargoyles, soaring spires, monumental organ and imposing bell towers are as beautiful as they are ominous. Experience history unfold as your expert guide recounts the amazing history of Notre Dame from antiquity to today on this incredible journey into the heart of medieval and Gothic Paris. For a dramatic finish, we will skip the long line to climb the 387 steps to the Notre Dame Bell Towers for a gargoyles-eye view of Paris. The long queues can last up to two hours, so skip the line and go to the head of the tour. In the heart of the Ile de la Cité, this guided tour will let you discover three wonderful places: the legendary Notre Dame, the Conciergerie and the Sainte Chapelle. History, art and mysteries, from the Middle Ages to the French Revolution. In the heart of the Ile de la Cité, this guided tour will let you discover the history and the interiors of three wonderful places: the legendary Notre Dame, the Conciergerie and the Sainte Chapelle. Our Art History experts will tell you the history and mysteries of the famous Cathedral where Victor Hugo set his famous Hunchback of Notre Dame. Then, you will go with the guide to visit the Conciergerie, the ancient court of the French Revolution, today picturesque place where you can find cells and tombs of revolutionary heroes and criminals. Later, you will go with the guide in the adjacent Sainte Chapelle, one of the most beautiful Gothic architectures in the world, with its ancient stained glass windows that will leave you in awe for their colors and their beauty. Enjoy this 2-hour private tour and learn the history and secrets of Paris, by walking through its Ile de la Cité quarter, one of two natural islands on the Seine River located in the center of the city. Once you meet your guide at the designated meeting point, you can get ready for a walking tour that will introduce you to the history and culture of the center of the city. Walk in the shadows of Notre Dame's Gargoiles to see the Sainte Chapelle and the high tower of St. Jacques, before crossing the ancient streets and the historic bridges such as the Ponte Neuf. Follow the trail of the Templars, learning about the Hundred Years' War, Marie Antoinette of Austria, Louis XIV the "Sun King", the two Napoleons, and much more. Highlights of this tour will be Notre Dame Cathedral visit, the Ile de la Cité tour, Ponte Neuf, the Jewish Island and view of the Louvre Museum, as well as many others. Enter your chef home near Notre Dame and and enjoy a social dinner focused on regional recipes paired with French fine wine. You will start with the french traditional welcoming drink which local Parisiens call KIR ( its a kind of mix of white wine and blueberry cream). Enjoy an amazing dinner with a focus on regional recipes from the North of France paired with Bordeaux and Borgogne wines. For more comfort, your tour starts directly at your Parisian accommodation. Our local guide greets you and takes you on a wonderful journey through Paris. It's time to head to our first major site, the world famous Notre Dame Cathedral. From there, you will wander through the ever-charming Cité Island, where the soul of Paris resides. From Place de la Concorde you'll see the gem of Napoleon : the Arc de Triomphe. Your day continues to the iconic Eiffel Tower area. Admiring the Eiffel Tower from the best photo spots is a real treat. At the end of the tour, you will remember a walk through Art, History and Culture like no other. This is where your local guide will give you a list of recommendations for where to go and what to do for the remaining days you have here with us. There is nothing like tips and advice from a friend who lives in the city! Make your own way to Notre Dame Cathedral and take the opportunity to get Audio Guide and skip the Line Access. Explore the inside and outside of the Monument at your own pace while listening to the commentaries ( available in 8 languages) . Then you will enjoy a walking tour of the Latin Quarter! The maximum participants for this tour is 15. Make your own way to one of the finest example of the French gothic Architecture: Notre Dame de Paris Cathedral . Located right on the island "de la Cité" in the heart of Paris ( Nearest Metro line 4 : Cité). Once facing the monument, you will have to redeem your voucher on the far right door of the main entrance in order to get your Audio Guide with Individual interactive map. Once you are at the door you'll have the normal queue on the right and a passage on the left, please show you voucher to the attendant to skip the line and have access to the redemption booth to get the audio guide and plan. You will additionally get a static cling decoration of the stained glass window as a welcome gift. Explore the inside building at your own pace while listening to the commentaries and capture some fascinating treasures such as the Rose Windows and many more. For those who wish to see the stunning view of the city over all the most important landmarks, you will have to climb many steps but very well worth it and particularly memorable. The 3 Portals are decorated with a multitude of characters relating the Last Judgement, The Virgin and St Anne. After using the Audio Guide, remember to bring it back at the Cathedral reception.Then by crossing the parvis south over the Petit Pont, you will find on your left side the legendary Bookshop in Paris: Shakespeare and Company, veritable institution and cultural link between France, Britain and the US. Down the road you will explore the lively Latin Quarter: one of the oldest neighborhood of the City with its many historical curiosities. The area remains still the place where many students gather for a night out. You might stay at the end of the tour enjoying the surrounding and its animated Atmosphere. Explore historical areas of Paris by coach and enjoy an in-depth visit to Notre Dame Cathedral on this fascinating sightseeing tour. See and learn about top Paris attractions including Palais Garnier, the Luxembourg Gardens (Jardin du Luxembourg), the Louvre, Place de la Bastille (Bastille Square) and the Latin Quarter. Depending on the time of year, enjoy a brief Seine River cruise or mini-coach ride to Ile de la Cité, home to Notre Dame Cathedral. Admire the cathedrals breathtaking Gothic architecture from the outside and step inside to marvel at its grand interior as your guide explains the history and importance of this beloved monument. Meet your guide in central Paris just after 9am and board your luxury, air-conditioned coach to travel to the oldest and most intriguing parts of Frances capital city. As you explore some of Paris best-known historical landmarks, your guide will explain their significance. See octagonal Place Vendome and marvel at Palais Garnier, the world-famous opera house used as the setting for The Phantom of the Opera. Witness the magnificent architecture of the Louvre, the worlds most-visited museum, and the massive Hotel de Ville (City Hall). The photo ops continue as you head to Place de la Bastille (Bastille Square), where the French Revolution began. View the old mansions in the Marais District and sense the youthful energy of the Latin Quarter, home to the famous Sorbonne, which houses several academic institutions. Your guided coach tour also goes to the legendary Luxembourg Gardens (Jardin du Luxembourg), the second-largest public park in Paris, and St-Germain-des-Prés, a neighborhood favored by celebrated writers and philosophers including Ernest Hemingway, Simone de Beauvoir and Jean-Paul Sartre. In warmer months (April - Oct), board a boat for a short cruise on the Seine River to Ile de la Cité, an island in the heart of Paris that is the site of the famous Notre Dame Cathedral. During the winter, travel to Notre Dame by mini-coach for a more comfortable experience. Enter this iconic Paris landmark (except on Sundays and during Mass) and learn about its rich and colorful history from your guide. For instance, hear how the centuries-old Gothic cathedral was damaged during the French Revolution and later restored to its former glory. After your visit to the cathedral, make your way back across the Seine and end your nearly 4-hour tour of historical landmarks with a coach ride back to central Paris. Meet your guide on Ile St-Louis and start your tour off with coffee and croissants  a breakfast or snack in typical French fashion. Cross over to Ile de la Cité and enjoy wrap-around views of Notre Dame Cathedral before stepping inside to explore one of the most famous churches in the world. Perched on an island in the middle of the Seine River, Notre Dame was built in the 12th century during the reign of King Louis VII. It remains the finest example of French Gothic architecture in the world, and is the symbol of medieval Paris. As you enter beneath the imposing towers of the cathedrals western façade, take a close look at the ornate stone carvings adorning the exterior. Inside, learn the significance behind several of the surviving statues of Notre Dame, stained-glass windows and religious artifacts on display. Also on Ile de la Cité is the Sainte Chapelle, the second stop on your tour. This grand 13th-century church was built by King Louis IX for use as his royal chapel. Marvel at its beautiful interior, dominated by the dazzling display of stained-glass windows filling the nave. Listen as your guide explains their significance, craftsmanship beauty in detail. Next, make your way to the Conciergerie. This medieval building (which now houses the Paris law courts) is the oldest royal palace in Paris. It was the residence and seat of power of the French kings for centuries during the Middle Ages, then it was converted into a prison in the 15th century. You will see the impressive 14th century Hall of Men-at-arms where the banquets took place in the Middle Ages and the Guardroom with its gothic style vaults. Then you will tour the prison itself, with the Grooming room where the condemned prisoners were stripped from their personal belongings and you will see the different cells, including that of Marie-Antoinette, where she spent the last weeks of her life before being beheaded by guillotine. Discover medieval history on the age-old streets of Paris on this 2.5-hour Ile de la Cité and Notre Dame Cathedral Paris Combo tour. Save time and money by visiting two of Paris top attractions in one day. Explore Île de la Cité in the center of the Seine River, and gain insight into its 2,000-year history. Stand beneath the imposing towers of Notre Dame Cathedral to admire their Gothic architecture, then head inside with your guide. Beat the lines and enjoy fast-track entry to Sainte Chapelle, King Louis IXs 13th-century chapel. Meet your guide near central Paris Notre Dame Cathedral in the early afternoon, and then set off through the famous Île de la Cité district to begin your tour. Stroll through Île de la Cités ancient streets and gain insight into thousands of years of colorful history. Hear tales of royal scandal, gruesome revenge, political uprisings and romantic dalliances, and enjoy fine views over the Seine Rivers UNESCO-listed banks. Marvel at Notre Dame Cathedrals grand facade and imposing towers, and listen as your guide explains the stories held within its beautiful Gothic stonework. Gaze over the gargoyles and see for yourself why Victor Hugo chose the cathedral as the setting for his 19th-century masterpiece: The Hunchback of Notre Dame. Head inside Notre Dame Cathedral and, if the time is right, hear the mighty organ or lofty bell towers come to life. Listen as your guide sheds light on Notre Dames turbulent history and admire the archways, buttresses and statues for which the cathedral is famous. Continue to Sainte Chapelle, a former chapel of King Louis IX. Enjoy skip-the-line entry to step straight inside and marvel at the chapels display of stained glass windows, its one of the most extensive displays in the world. When your Sainte Chappelle visit comes to an end, step outside the chapel to conclude your tour. Beat the queues and save money at two of the French capitals top attractions with this small-group Paris Super Saver. Begin with a walking tour of the Île de la Cité before skipping the lines at the UNESCO-listed Notre-Dame Cathedral, where youll climb the towers for spectacular city views. Then, follow your guide along the hallowed hallways of the Louvre Museum and admire ancient masterpieces like the Venus de Milo and da Vincis Mona Lisa. Combine two best-selling tours and make the very most of your Paris vacation. Skip-the-Line Notre-Dame Cathedral Tour (2 Hours)Meet your guide and small group in central Paris in the morning and begin with a walking tour of the citys famous Île de la Cité area. The true heart of the French capital, the Île de la Cité has been home to royalty, revolutionaries and those famous gargoyles for centuries. Explore the vibrant flower market and wander along the banks of the Seine River to admire French Queen Marie Antoinettes final residence. Finish your Île de la Cité stroll beneath the imposing façade of Notre-Dame Cathedral and cast your gaze over the ornate stonework on display. This UNESCO World Heritage-listed Gothic masterpiece  made famous in Victor Hugos The Hunchback of Notre Dame  is widely considered among the most beautiful buildings in all of Paris. Listen as your guide details the intricate construction techniques used and marvel at the flying buttresses, towering spires and imposing bell towers which feature across the buildings mighty exterior. Follow your guide inside the cathedral and admire highlights such as the 13th-century stained glass windows and the carved wooden stalls of the central choir. Enjoy skip-the-line entry up the steps to the top of the famous towers and share breathtaking views of the French capital with the cathedrals menacing stone gargoyles. Your first tour finishes at Notre-Dame Cathedral at approx. midday. Take two hours of free time for lunch at your leisure (own expense), then head to the Louvre Museum for your next tour. Skip-the-Line Louvre Museum Tour (3 Hours)Follow your guide through the Louvre's spectacular courtyard then beat the queues and enjoy skip-the-line entry inside the museum. Admire famous masterpieces such as the Venus de Milo and the 2nd-century Winged Victory of Samothrace with your guide and gain insight into their historical significance. Wander through the Italian Renaissance wing, where masterpieces by Michelangelo await. Explore the Apollo Gallery and behold the ornate royal crowns of Napoleon and King Louis XV. Then, stand before da Vincis Mona Lisa, considered by many to be the Louvres most precious treasure. Your small-group tour then concludes inside the Louvre, leaving you free to continue exploring independently, should you wish. Special Offer - Book this tour and save 14% compared to booking each attraction separately! - Book Now! Take in two of the French capitals top attractions in one day and enjoy skip-the-line entry to the Musée d'Orsay and discover the largest collection of Impressionist art in the world. Cast your gaze over famous works by luminaries such as Monet, Degas and Renoir. Explore the cobbled streets of Île de la Cité with your guide and visit the Gothic masterpiece of Notre-Dame Cathedral to admire its valuable treasures. Save time by booking this combination of two best-selling Paris tours. Skip-the-Line Musée d'Orsay Tour (2 Hours) Meet your guide near Paris famous Musée d'Orsay in the morning and enjoy skip-the-line entry to beat the queues and head straight inside the museum. Home to the worlds largest collection of Impressionist paintings, the Musée d'Orsay is widely considered among Paris finest museums and gallery spaces. On your 2-hour tour, admire magnificent masterpieces by luminaries such as van Gogh, Degas, Cézanne, Renoir and Lautrec, and gain insight into their lives and works from your guide. Explore the museums impressive collection of Monet classics  including Falaise de Fécamp and his Rouen Cathedral series  and learn of the innovative techniques for which he is famous. After two hours, your tour concludes in the Musée d'Orsay. Enjoy a relaxing break for lunch (own expense) then take the short, picturesque stroll along the banks of the Seine River to the Île de la Cité  the meeting point for your second tour. Notre-Dame Cathedral Tour (2 Hours) Begin your afternoon tour with a guided walk around Paris famous Île de la Cité, the true heart of the French capital. Explore the vibrant flower market and discover important landmarks such as Queen Marie Antoinettes final residence. Follow your guide to the spectacularly beautiful Notre-Dame Cathedral  considered by many to be the finest example of 12th-century Gothic architecture in the world. Marvel at the ornate stonework on the cathedrals imposing façade and listen as your guide details the complex construction techniques used. Join the main admission lines, and then head inside to admire the cathedral's valuable treasures such as the 13th-century stained glass windows, the organ and the carved wooden stalls of the central choir. After two hours exploring the Île de la Cité and Notre-Dame Cathedral, your Paris Super Saver tour will come to an end inside the cathedral. Île de la Cité is a small island in the Seine river with an huge influence on the history of France. Its where Paris was first settled, where some of the citys greatest dramas were acted out, and where the most beautiful buildings were constructed. Find out how this tiny island became the center of one of Europes most vibrant cultures with the most complete tour of the Île de la Cité on the market; including skip the line tours of Sainte Chapelle, La Conciergerie and Notre Dame Cathedral, with special access to climb the towers! Your in-depth exploration of the histories, myths, legends, and lore hidden behind the stones of Paris most interesting neighborhood begins at Notre Dame Cathedral, where youll meet your expert guide and an intimate group of 15 people or less. From the Gothic splendor of the bell towers of Notre Dame that inspired Victor Hugo to create his hunchback bell-ringer, to the darkest cells in the Conciergerie where condemned dissidents awaited death during the Reign of Terror, the Ile de la Cité has witnessed the best and worst of Parisian history, and youll hear all the stories that make it such an interesting place. Inside Notre Dame, marvel at the famous Rose Window, admire the stunning arches of the Gothic architecture, and learn how Victor Hugo and his Hunchback of Notre Dame actually saved this beautiful building from demolition. Then travel back in time, exploring the streets of Ile de la Cité as your guide tells you what life was like here from the Middle Ages to the French Revolution (hint: it wasnt nearly as clean as it is today). Stop in the Conciergerie, a lovely building with a dark past that was used to host the tribunals of the Revolution and to imprison political prisoners awaiting their date with the guillotine. The building was recently renovated, including the cell where Marie Antoinette spent the last days before her execution under heavy guard and in very difficult conditions. Youll also see a second cell where she was briefly kept, now converted into a tiny chapel. After these dark delights, enjoy something much more life-affirming. If you thought Notre Dames Rose Window was beautiful, Sainte-Chapelle is going to blow you away. This royal chapel was originally built to house relics, and today its still one of the most jaw-dropping rooms in Paris. Its also one of the citys most popular attractions. Luckily, you have skip-the-line tickets, so youll walk right past entrance line that can be hours long. After a lunch break (with plenty of restaurant recommendations from your guide; own expense), reconvene for skip-the-line access to the towers of Notre Dame. With a timed entrance, your guide gets you past long line and straight inside, accompanying you to the first-level foyer and then leaving you to do the climb and visit at your own pace. Like at Sainte-Chapelle, the towers of Notre Dame are popular for good reason  youll get up close to the famous gargoyles and inside the bell tower to see where the hunchback lived. Your tour provides access to the highest point of the cathedral, too, with a 360-degree vantage point for some of the best views of the city. After all, when you climb the Eiffel Tower, you cant see the Eiffel Tower! From Notre Dame, however, you have the whole city at your feet. Pack all of Pariss main attractions into a single, unforgettable day on our complete Paris in a day trip. In the company of a local expert guide and a small-group (maximum of 15 people), youll see the citys main monuments and learn a lot of its hidden secrets while traveling by foot and metro. From the windmills of Montmartre, to the sanctuary of Notre Dame, the halls of the Louvre, and the second floor of the Eiffel tower; you will cram more postcard worthy attractions into one day (9/10.25-hours) than you would see in a week of normal sightseeing. Your day starts at the base of Montmartre, a Parisian neighborhood perched on a hill, where youll meet your guide and small group of no more than 15 people. Paris is a city with a lot of history and even more attractions, so in order to see the best of it in one day, it helps to do so with an expert guide who takes care of logistics and tells you the story of the city as you go, including its characters, facts, myths, and lore, creating a memorable experience. First up, take the funicular to Sacré-Coeur Basilica. After admiring stunning views of the city, your guide leads you through the winding streets of Montmartre, stopping off at the neighborhood vineyard, the artist hangout Place du Tertre, and a reconstructed windmill, much like those made famous by the cabaret club (and movie) Moulin Rouge. Next, catch the Metro  Paris best mode of transport  for a short trip to Ile de la Cité, Paris oldest district. As you explore the narrow streets of the island and step inside world-famous Notre Dame Cathedral, youll learn how Paris grew from a Roman outpost into the crown jewel of Europe. From Ile de la Cité, its a short walk to the Louvre, where you have a 1-hour lunch break (own expense; recommendations will be provided by your guide) before diving into the largest art museum in the world to see some of its most spellbinding works of art. The highlight is, of course, Leonardo da Vincis Mona Lisa. Your guide helps you understand why the painting is so significant and how, after all these years, it has managed to maintain its reputation as one of the worlds greatest works of art. After another short subway ride, find yourself staring up at the Eiffel Tower from the best vantage point at Place du Trocadéro, learning the incredible story of how the tower was built. When you get to the base, youll skip the line and climb directly to the second level for more great views of Paris. Your guide leaves you at the tower, but as a parting a gift, gives you a ticket for a 1-hour Seine River cruise that you can use immediately (recommended as it will almost be sunset) or save for the next day. Cruising from west to east and back again, the boat tour passes such monuments as the Musée d'Orsay, the Louvre, and Notre Dame, allowing you to enjoy a different perspective on sites you saw earlier, plus many beautiful bridges including Pont Neuf (audio included if you wish). And thats it! In just one day, youll have seen Paris by foot and water, skipping its longest lines to see its most popular attractions, plus a few local favorites along the way. Join us for a guided walk through the historical center of Paris, the Ile de la Cité, and visit the citys two most spectacular gothic monuments. The world famous Cathedral of Notre Dame and the spectacular Sainte Chapelle with its unmissable stained glass windows. You will also visit the Conciergerie, once a palace of kings, later an infamous prison and the last home of Queen Marie-Antoinette. Don't miss the chance to enjoy a delightful stroll around the charming streets and squares of this tiny island in the heart of the city. The tiny and picturesque Ile de la Cité is the island on which Paris was born. Join us for a stroll around this charming area, packed full of history and world-renowned monuments. See spectacular gothic masterpieces, dazzling stained glass and revolutionary prisons, all set against a backdrop of quaint side streets and delightful squares. Meet us at the Pont Neuf or New Bridge, actually the oldest bridge in Paris, as we begin our tour of this lovely island. Here you will learn about the pretty 'Square du Vert Galant' and why it got its name thanks to a much beloved King of France. It's now a favorite place to sit and enjoy a picnic by the riverside. A stroll through one of the most elegant small squares in Paris takes us past the imposing law courts and the oldest public clock in Paris. Our first visit is to the Conciergerie. Once a royal palace, it later became infamous as a revolutionary prison and place of torture, serving as Queen Marie-Antoinettes last home before she was taken to the guillotine in 1793. See the conditions in which the prisoners were kept and learn the stories of those who lived and died during this most turbulent period of French history. Your guide will then lead you to the Sainte Chapelle, a tiny gothic masterpiece that must not be missed. Well skip the often long lines, and ascend to the upper chapel to view the stunning stained glass windows. Many of these windows are the originals dating from the 13th century, and a recent renovation has brought back to life their dazzling and vibrant colors. To give you a full understanding of their significance, your guide will help you read them! Its then a short walk from to the world famous Notre Dame Cathedral. This 850-year-old gothic church found fame thanks to Victor Hugo and his Hunchback. Your expert guide will accompany you into the church and lead you around the interior, showing some of the largest rose windows in Europe and where the relics of Christs crown of thorns are kept. Youll also have a chance to admire the magnificent exterior of the cathedral and hear of the personalities bound up in the fame of the cathedral. Join us for an afternoon spent exploring one of the most historic and fascinating parts of the city. Let your family enjoy a 3 hour skip-the-line Private tour of Notre Dame and Latin Quarter tailored for kids and families. Your kids-friendly guide will entertain the whole family with facts and activities! You will visit Notre Dame Cathedral and climb up the towers up to 800 feet and enjoy its incredible Gothic gargoyles. Continue to the picturesque Latin Quarter on the left bank of the Seine River, where you will see the Sorbonne University, visit the magnificent Pantheon and be guided through the narrow medieval lanes and historic buildings. Our kid-friendly guide will meet your family at Notre Dame and your skip-the-line private tour will start! You will firstly climb the towers of this amazing mediaeval cathedral reaching its roof top up to 800 feet. Your guide will show you the legendary gargoyles and you will enjoy a splendid view of Paris. Then you will visit the Cathedral and move to the Latin Quarter on the left bank of the Seine River. This neighborhood was the center of the bohemian life once and it is today a popular area for students with the historic Sorbonne University as its center, alive with bookshops, publishers, galleries, cinemas and theaters. Our professional guide will entertain and engage kids and adults with interesting facts and activities about the landmarks of the Latin Quartier. The tour will end with a visit of the Pantheon. Take your family to an exploration of Ile de la Cité, the very heart of the City of Light. During this 2-hour walking tour we will unveil all the secrets of what is considered to be the epicenter of Paris, a small island on the River Seine whose focal point is of course the Notre-Dame Cathedral and its Towers. Further highlights include the flower markets and Pont Neuf bridge, the oldest and most historic bridge in Paris. Explore the history of Paris starting from the French capitals foundations: Ile de la Cité is considered to be the original site of the earliest settlement in Paris, the Parisi tribes, from which the modern city has spread. This small island on the River Seine is one of the most beautiful locations in the City of Light, and it is well worth an in-depth exploration. Your private guide is very experienced with families of all combinations and children of all ages; we will ensure everyone in your party is engaged in the history and landmarks of the island. Visit Notre Dame Cathedral and climb up the towers up to 800 feet and enjoy its Gothic gargoyles, and all this with a skip-the-line access! Your guide will show you the legendary gargoyles and you will enjoy a splendid view of Paris while learning all about this fascinating place. You will then head to the flower market, where you will get a glimpse of the real City of Light while strolling through the colors of the market stalls. Your guide will finally show you the oldest and most iconic bridge of Paris, Pont neuf, which ironically means New Bridge: As the first bridge in Paris built in stone, it soon became one of the most popular meeting places in Paris and a focal point of the city life over the centuries. Do not miss the chance to discover the very heart of Paris with the whole family! Start your exploration of Paris from the most legendary monuments in Paris, with our 3-hour guided private tour which will entertain each and every member of the family! Have fun climbing up the Notre Dame towers and let your kids play with the guide while looking for gargoyles! Let the stunning stained glass of the Saint-Chapelle take your breath and learn everything about the dark past of the Conciergerie during revolutionary times. Your private guide, who is very experienced with families of all combinations and children of all ages, will take you on a stunning journey through the most thrilling chapters of the history of Paris. You will have a skip-the-line access to visit the famous Notre Dame Cathedral, climb up the towers up to 800 feet and enjoy its Gothic gargoyles along with its incredible stories and legends. Enjoy a splendid view of Paris while learning all about this fascinating place! You will then discover the history of Paris at the Conciergerie, which went from being a royal residence and seat of royal power, to being the seat of the palace of justice with a section of the palace turned in one of the harshest prison in France during revolutionary times, where Marie Antoinette spent her final hours. We will finally take you to the St. Chapelle, which is considered the most beautiful church in Paris and surely one of the most impressive Gothic architectures in the world, where you will admire the finest stained glass you will ever see. Feeling the way a treasure hunter feels is a wish this Family tour around Notre-Dame could fulfill. Provided with an activity booklet, your children will be helped by a certified art historian to unveil the secrets of Notre-Dame and to explore Ile de la Cité medieval side streets. Both informed and entertained, your kids will remain engaged all this 2-hour tour long and have to use their best observation skills. Like apprentice archaeologists, theyll discover indications along their way to solve a final enigma. Everybody has his magnifying glass ready? Okay lets go on the trail of mystery! Your tour begins at Notre-Dame cathedral, just where the city of Paris was long ago born. Nowadays, the surroundings are vast and clear. By checking their booklet, your children will discover what the location looked like during the Middle Ages. Differences will have to be noticed. Turning around the cathedral, youll discover the beautiful church flanks, the archbishopric gardens with the genuine bronze bells on display. The incredible array of flying buttresses and roof statues will astonish the whole family. Then your guide leads you where this old Paris managed to survive. Away from the district main thoroughfares, your kids have to open their eyes to discover next clues in quiet lanes with ancestral cobblestones. Should a part of the puzzle miss, the main enigma wont be elucidated. Every step matters in an archeological quest. You next stop is the French Kings Palace, where other details are to spotted on walls or roofs. Raising ones nose up to the facades of yesteryear is not an option, but the treasure hunter duty! Neighboring Notre-Dame, La Huchette district will give your family the opportunity to sneak through old streets, as narrow as they formerly were. The Saint-Séverin church surroundings is a bustling area, as lively as it was at crusaders time. A medieval Paris tour owes to include a glance at the Middle Ages National Museum. Youll walk along its precinct. Even from the outside, the building looks exquisite. Its Gothic arcades, its ornamental windows and skylights, its multi-centenary walls are surrounding by a charming garden. The last riddles are on sight and soon, your children will be the holders of the Paris names secret. Such a treasure hunt deserves a further reward: that of a drink, quietly sat in a typical French café, discussing last questions and lingering curiosities. Join your professional historical guide and no more than 7 others and enjoy a 3-hour walking tour discovering the Notre-Dame district. Walk along poetic quays and medieval streets, step back in time and walk in the shoes of celebrities who lived on Ile de la Cité and Ile Saint-Louis. Discover Paris's past, from the Middle Ages up to the 20th century. No need to put any costume on! You will just have to pick up one of our "Character Cards" and discover... who you are! You could be a crusading knight, a pioneering female sculptor, a French Romeo and Juliet,just to name a few! Follow your Licensed guide for both a discovery of the Notre-Dame district highlights and a unique encounter with people who shaped Pariss past, from the Middle Ages to the 20th century. Meet your guide on the Pont-Neuf bridge at approximately 2:20 p.m. for your historical walking tour. Begin your tour at Henri IVs equestrian statue which is also the place where a Templar crusader was executed. Next, onward to the Place Dauphine, a perfect example of 17th century architecture. Here you'll make a stop for Manon Roland, a revolutionary Muse. Circling around the former royal palace buildings, now a law court, you'll reach the Conciergerie. This notoriously famous jail during the French Revolution kept a female prisoner. Time to approach Notre-Dame, Pariss majestic cathedral! On its northern flank, a medieval-like quarter has survived, with winding streets and secluded houses. Enter into this beautiful Gothic church and enjoy the amazing show of its authentic 13th-century stained glass windows. Cross a short footbridge, to the peaceful environment of Ile Saint-Louis. You would be surprised how boisterous and naughty some former inhabitants were such as the hothead duke, a Louis XIV's companion, who dared to challenge the King. Strolling along Quai dOrléans and de Béthune, you will be introduced to Camille Claudel, a gifted sculptor and Helena Rubinstein, the first female captain of industry. Both talented, they called for women's freedom. Your tour will concludes at Saint-Paul metro station at 5:00 p.m. In this 2-hour enchanting walking tour, celebrate the holiday season in the picturesque neighborhood of Notre-Dame. Witness the most eye-catching Christmas illuminations and browse Notre-Dames Christmas market while tasting typical French Christmas products. But it doesnt stop here! A visit inside the Notre-Dame cathedral is also scheduled! Meet your guide close to the tallest Christmas tree of Paris, facing the Notre-Dame Cathedral. Its façade will blow you away with its thoroughly detailed architecture. A big history of France can be depicted from the façade. Once inside the cathedral, the stained-glass rose windows will astonish you. Your guide will explain why they are the churchs jewels! Get ready to see the impressive Nativity scene, located in Notre-Dames choir. The Christmas crib figures are added throughout the event, giving you a sort of series to watch for a month! As you cross the Seine River, you will enter the René-Viviani public garden. It is the most appealing garden of Paris usually unknown to tourists. A traditional Christmas market is held, offering local arts and crafts stalls as well as few French specialties served during Christmas: dried sausage, foie gras, famous macaroons or even delightful glazed chestnuts. As you walk down few cobblestone streets, you will reach a tearoom where a hot drink awaits you! Chocolate flavored with spices or a mulled cinnamon wine, you decide! Discover top Paris attractions along the Seine River and enjoy a skip-the-line tour of the Louvre Museum on this 5.5-hour historical walking tour. Starting at the foot of Notre Dame Cathedral, get a comprehensive overview of Paris as you stroll past the Musée d'Orsay, Place de la Concorde, the Champs-Elysées, the Eiffel Tower and more. Then beat the Louvre queues with your skip-the-line ticket and marvel at world-famous masterpieces including the 'Mona Lisa' on a 2-hour guided tour. Your group size is limited to 5 to ensure a personalized experience. The banks of the Seine River are lined with some of the most famous and historic attractions in Paris  and the world. This 5.5-hour walking tour covers most of them, beginning from Ile de la Cité. Lying in the heart of Paris, this island is where the ancient city was founded, so it's the perfect place to start your historical walking tour. Admire the imposing Gothic architecture of Notre Dame Cathedral, and then set off with your guide down the Seine River. Strolling along the Seine's picturesque riverbanks, you'll come across top Paris attractions including the Pont Neuf and Pont des Arts, the Musée d'Orsay, the Musée de l'Orangerie, the Jardin des Tuileries, Place de la Concorde, La Madeleine, the glamorous Champs-Elysées and, of course, the Eiffel Tower. Learn about the centuries of history, architecture, art and culture that have helped shape Paris, and listen as your guide points out some secret spots along the way only known to locals. Ending your walk at the Eiffel Tower, take a break for lunch (own expense) at a local cafe or restaurant. Then hop in a private vehicle for the short drive to the Louvre Museum. As one of Paris must-do attractions, the Louvre attracts notoriously long entrance lines, but you'll enjoy skip-the-line access and head straight inside for a 2-hour guided tour. Navigate the Louvre with ease as your guide takes you to the museum's major works and lesser-known treasures that many visitors miss. Marvel at da Vinci's Mona Lisa, Delacroix's Liberty Leading the People and Géricault's The Raft of the Medusa. Gaze upon Italian Renaissance works including Michelangelo's Dying Slave, paintings from France's Romanticism and Classicism periods, and Greek and Roman sculptures including Venus de Milo. You'll also learn about the Louvre's magnificent architecture  this extravagant building complex was built as a palace for powerful French emperor Napoleon Bonaparte. At the end of your Louvre tour, feel free to continue perusing the museum at your leisure, or ask your guide for recommendations on other sights and activities to enjoy during your time in the French capital. With a private guide, take a 2.5-hour walking tour of one of Paris oldest and most iconic neighborhoodsthe Latin Quarter. Youll start with a visit to Notre-Dame Cathedral before making your way on foot to the playground of French students and the Lost Generation. Sights include the Panthéon and Luxembourg Garden. Select a morning or afternoon departure time when booking. Meet your private guide on Ile de la Cité to begin your Latin Quarter walking tour at Notre-Dame Cathedral. Then walk across the Seine and onto the Left Bank, into the Parisian neighborhood that both Hemingway and Fitzgerald, among other writers, once called home. From ancient Roman ruins to the backdrops for Woody Allens film Midnight in Paris, this tour takes you through the centuries that have shaped this historical and cultural district. Learn about its intellectual roots at the Sorbonne, or discuss the famous thinkers buried under the Panthéons majestic dome. Pal around with todays literati as you browse the stacks at Shakespeare and Company bookstore, and then discover Luxembourg Garden (Jardin du Luxembourg), the most beautiful park for finding a bench and reading a few chapters. Theres no shortage of fascinating stories that your guide shares with you as you stroll along the cobbled streets of the Latin Quarter, each more charming than the last. Take a 2.5-hour walking tour of one of Paris oldest and most beloved neighborhoodsthe Latin Quarter. You'll start with a visit inside Notre-Dame Cathedral before making your way on foot to the playground of French students and the Lost Generation. Sights include the Panthéon and Luxembourg Garden. This small-group tour is limited to 10 people to provide personal attention from a guide. Meet your guide on Ile de la Cité to start your Latin Quarter walking tour close to the Notre-Dame Cathedral. Then head across the Seine and into the Parisian neighborhood that both Fitzgerald and Hemingway, among other writers, once called home. From ancient Roman ruins to scenes from Woody Allens movie Midnight in Paris, this tour takes you through the centuries that have shaped this historical and cultural district on Paris' Left Bank. Learn about its intellectual roots at the Sorbonne, or discuss the famous thinkers buried under the Panthéons majestic dome. Mingle with todays literati as you browse the stacks at Shakespeare and Company bookstore, and discover the beauty of Luxembourg Garden (Jardin du Luxembourg), the perfect place to find a bench and read a book. Theres no shortage of interesting stories that your guide shares with you as you wander along the Latin Quarter's cobbled streets, each more charming than the last. Become a true flâneur  French for someone who enjoys a good stroll  on this 2.5 hour intimate group tour of central Paris. Our expert guides will take no more than 10 travelers with them as they show you all of the highlights including a visit to the inside of Notre Dame and the Tuileries Garden while ending where the guillotine once stood at the base of the worlds most famous avenue, the Champs Elysées. There will be time for a snack and restroom break during the walk. Start your tour in Paris, which has been pivoted around Notre Dame for centuries. Head inside and marvel at its stained glass windows, some of the most impressive in the world. Visit the citys oldest bridge, the Pont Neuf. Pass through the brilliantly manicured Tuileries Gardens on your way to the Place de la Concorde, home of the guillotine. Embrace the citys iconic structures like the Saint Michel Fountain and Louvre. Learn fascinating and oftentimes stupefying stories of the citys biggest players, such as Napoleon Bonaparte, Louis XIV, and Henri IV. Become a true flâneur, French for someone who enjoys a good stroll, on this 2.5 hour private tour of central Paris. Expert guides will show you all of the highlights including a visit inside Notre Dame and the Tuileries Garden while ending on the worlds most famous avenue, the Champs Elysées. There will be time for a snack and restroom break during the walk. Paris has pivoted around Notre Dame for centuries, so its only appropriate to start your morning or afternoon tour here. Head inside and marvel at its stained glass windows, some of the most impressive in the world. Move onward across the citys oldest bridge, the Pont Neuf, passing through the always brilliantly manicured Tuileries Gardens on your way to the Place de la Concorde, home of the guillotine. Beyond just looking at the citys iconic structures like the Saint Michel Fountain and the Louvre, youll learn the fascinating and oftentimes stupefying stories of the citys biggest players like Napoleon Bonaparte, Louis XIV, and Henri IV. Set aside a half day to explore the absolute best highlights Paris has to offer on a 5 hour exclusively private trek through the historic heart of the city. Start at Notre Dame and stroll the Seine towards the worlds most famous avenue, the Champs Elysées before browsing the masterpieces inside of the Louvre, the worlds most visited museum. Have a lunch break before visiting the Louvre, where youll be able to skip the line with your guide. Paris has pivoted around Notre Dame for centuries, so we think its only appropriate to start our tour here. Head inside and marvel at its stained glass windows, some of the most impressive in the world. Well move onwards across the citys oldest bridge, the Pont Neuf, passing through the always brilliantly manicured Tuileries Gardens on our way to the Place de la Concorde, home of the guillotine. Beyond just looking at the citys iconic structures like the Saint Michel Fountain and the Louvre, youll learn the fascinating and oftentimes stupefying stories of the citys biggest players like Napoleon Bonaparte, Louis XIV, and Henri IV. Afterwards, well skip the lines at the Louvre to discuss the highlights and masterpieces that attract millions of visitors each year. By the end youll be well versed in the museums history and secrets, including why thousands of people take selfies with the Mona Lisa. With 35,000 pieces of art to discover on top of a rich architectural history, we understand if youre feeling a bit overwhelmed. This semi-private tour is designed to captivate first timers as well as Louvre connoisseurs who think they know it all. Youll visit statues like the armless Venus de Milo and the headless Winged Victory of Samothrace. Discuss paintings by Delacroix and Michelangelo. Explore the underground Medieval Moat and marvel at the opulent Apollo Gallery. Our expert guides will show you what you need to see at the Louvre, as well as a few surprises along the way. Learn about the hidden wonders of Notre Dame Cathedral during an introduction from your friendly host. Explore the UNESCO World Heritage Site on your own, and discover its stunning interior. Arrive at Notre Dame Cathedral early in the morning, and your host will welcome you with an introduction to the UNESCO World Heritage Site. Stand on some of the very first streets of Paris as you gaze up at the imposing cathedral. As you admire the architecture a quintessential Gothic cathedral, building started in 1163 and lasted over 170 years, listen to stories and facts from your guide, like whether the legends about the Hunchback of Notre Dame are true or if the gargoyles are alive. Once you have seen the cathedral from the outside, go inside to discover the beautiful rose windows reflecting on the floor with the sun. The city of Paris is famous for its pastries, bread, and coffee. If you are planning to go to Paris, or if you are already in the city and you want to know what a typical French breakfast is like, take your time to have breakfast in Paris. This should be a must on your to-do list. After you will explore the Cathedral of Notre Dame with a local guide. There is no better way to start your day! Meet your guide in a center of Paris at a traditional breakfast spot in a sidewalk café restaurant to start your day. You will learn how France is a breakfast country. Linguistically, the word for breakfast in French is petit-déjeuner which literally means little breakfast. - a pastry, such as a croissant, pain au chocolat or a viennoiserie; cereal with milk; or a slice of bread with a topping (like jam or Nutella). While you enjoy this delicious breakfast, your guide will tell you about the history of Paris and will give you tips about what to see, where to go and shop, and the best restaurants to go to. When you finish your breakfast, you guide will take you directly for a visit of the Cathedral of Notre Dame of Paris. Enjoy a guided introduction and Skip-the-Line access into two of the most beautiful and most visited monuments in Paris! Your guide will share the amazing history of the construction as well as the high and low points in the existence of these two jewels of Paris. At the Sainte-Chapelle you will skip-the-line and be allowed free time and access to see the stunning stained glass windows that Saint Louis had built for this chapel which was destined to house the Crown of Thorns. Then youll be escorted right to the front of the long line at the Towers of Notre Dame. There you will be able to climb the spiral stairs right to the top and get up close and personal with the gargoyles which protect the 800 year old church. - All tickets entrance included. Discover the beating Heart of Paris  The Ile de la Cité  on a 3-hour walking tour that includes a tasty French wine break. Set out to explore the authentic island on the Seine River. Let yourself be taken away by an expert local guide who shares fascinating tales about the area and introduces you to the history of Paris: from the Roman emperors to emperor Napoleon, passing by King Philippe Auguste until Louis XVI and Marie Antoinette, Notre-Dame to the Holy Chapel, etc. Taste some French wines, cheese and charcuterie in a 13th century cellar and enjoy your exclusive tour of the Heart of Paris. Follow your English-speaking guide through the colorful streets of the Île de la Cité. Your guide will tell you a series of unbelievable anecdotes about past love stories, spurned lovers, famous royal mistresses and much more upon your 2:00pm meeting point in Square René Vivian. Our Heart of Paris Tour will also give you the opportunity to have a comprehensive overview of some of the most famous historical monuments: the legendary Notre-Dame cathedral, the mysterious Conciergerie, the former Royal Palace. You will explore the narrow streets of the island, cross the most beautiful bridges and contemplate many other Parisian monuments. This tour is also a great opportunity for you to live two very French and exclusive experiences: enjoy some French wine, charcuterie and cheese, in a unique 13th-century cellar. Join us to our tour! Get to the medieval soul of Paris with a private 4-hour walking tour in the historic heart of the city - the Ile de la Cité. Explore the gothic details and magnificent architecture of Notre Dame Cathedral, inside and out. Get direct VIP access inside the vaulted stone ceilings of the Conciergerie prison and exquisite stained glass interiors of Sainte-Chapelle. Explore the key monuments of the Middle Ages - a time of kings, castles, and criminals - to discover the secrets of Paris past. Enjoy an in-depth yet relaxing tour with your private guide. Dive into the historic heart of Paris and explore the medieval highlights of the Île de la Cité. First up is Notre Dame Cathedral; now over 850 years old, the cathedral still reigns as a titan of Gothic architecture. Scour its exteriors of delicately sculpted stone and the messages of its intricate façade. Learn about the cathedrals famously hunchbacked bell ringer, the devilish myth of its main doorways, and how the French Revolution almost destroyed the cathedral. Inside Notre Dame discover striking stained glass windows, dizzying vaulted ceilings, and a plethora of unexpected details from long ago. Second on your exploration is the the Conciergerie; a former royal palace which was converted into a prison, famously used as the city's prison during the bloody days of the French Revolution. Relive the terrible conditions of the condemned by viewing prison cells from centuries ago, including that of the buildings most famous prisoner - Marie Antoinette. Finally, skip the long line in front of the Sainte-Chapelle to enjoy the most stunning medieval stained glass windows in the world. This private chapel of the king, completed in 1248, once housed Christs crown of thorns and was the most prestigious and powerful place in all the land. Discover all of Paris most well-known landmarks in one day with private transportation for a semi-private visit of the French Capital! The groups are composed of a maximum of 9 people to ensure a personalized experience. You will be accompanied by local guides that will tell you more about what makes Paris the famous and beloved city it is! A driver will pick you up at your hotel (in Paris) at 9 am to meet your professional guide at the Louvre Museum. There, you will have a semi-private tour of the museum where you will explore different time periods, like ancient Egypt with a real mummy or Renaissance with the famous Mona Lisa from Leonardo da Vinci. You will also discover the mysteries and legend of one of the most famous museums in the world! After your tour, you are free to go for lunch wherever you want; your guide will be there to provide suggestions. At 1:30pm, the car will take you to the Eiffel Tower for an exclusive skip the line access tour. Once there, your guide will give you an overview of Paris and you can even go up the top floor for a breathtaking view of Paris! After that the car will take you to see the magnificent Cathedral Notre-Dame de Paris, where your guide will tell you all about this masterpiece of gothic architecture. And last but not least, you will discover Montmartre, Paris secret village in an unusual tour of this artistic neighborhood where the Sacré-Cœur Basilica watches over Paris. At the end of the tour, around 7:30pm, your car will take you back to your hotel (in Paris) or to a restaurant of your choice (in Paris). This tour allows you to see all of Paris most famous landmarks in a very complete tour, without losing time in long queues and with comfortable transportation. Enjoy the most romantic city in the world without stress in an exclusive and organized tour with the privacy of a small group. Please note that the order of the activities can be changed according to events or closing times. Discover the best of the City of Light in a day including Notre Dame Cathedral, Louvre's masterpieces, the historical area and Montmartre, the most picturesque village in the capital. In seven hours, you will know most of the history of Paris from its origins to present day. Your tour starts at 9am in front of the Notre Dame Cathedral, the medieval symbol of Paris, built over the course of 200 years and considered an emblem of economical prosperity and religious power. Then you will step in to see its magnificent stained glass windows and learn about its architecture, its treasures, its medieval life and some historical events, all in just one hour. After your visit of Notre-Dame de Paris, embark for a 90-minute city walking tour, which will unveil the secrets and past of the main monuments and buildings bringing them back to life, including Ile de la Cité, Saint Chapel, oldest bridge 'Pont Neuf', the Lovelocks Bridge 'Pont des Arts'. The old entrance of the Louvre will mark the end of the city tour and the beginning of our visit to the most visited museum in the world. You will admire its most famous masterpieces, such as the Venus de Milo, the Victory of Samothrace, the Mona Lisa, and other Renaissance and French paintings as well as a few other jewels. For your lunck break you have three recommended options: you might choose a "creperie and cider" next to the louvre, a self service restaurant on Rivoli street or just a coffee break either at Saint paul bakery inside the louvre or restaurant of your own choice. They have all reasonable prices. Another option is to go straight to Montmartre after the louvre tour, and have lunch on the hill. Montmartre will be your last stop. This Bohemian neighborhood that hosted artists, such as Vincent Van Gogh, Toulouse-Lautrec, Picasso, Maurice Utrillo, Manet, Modigliani, and revolutionized art history. A unique small-group experience that will end at 4pm at the foot of the Sacred Heart Basilica, a National Vow dedicated to expiate an immoral nineteenth century. Remember to bring comfortable shoes and light backpacks considering that it is a walking tour. This 1-Hour tour starts in front of the central portal of Notre-Dame de Paris at 10.30 am. You will first observe its magnificent facade and discover numerous details illustrating the Bible. After looking at the cathedral exterior, you will step inside the monument to understand its construction, its new architectural style and historical dates and events that have shaped it. The visit starts by reading the facade of the cathedral of Notre Dame which was conceived as an open book. Many great details can be discovered on each of them some related to the Virgin Mary and some others to the historical life of city of light. Considered as one of the finest example of french gothic architecture, we will learn about this new architectural style and its main elements. Constructed in the 12th century, its location, the 'île de la cité', was once the shelter of the first inhabitants which makes it the symbol of the city and the background of a worldwide story the Hunchback of Notre Dame and his tragic love for Esmeralda. By the way this is the icing on the cake. Come and discover life in the middle ages, its architectural style and the symbolism behind its stained glass windows, gargoyles and chimeras. Let me tell you all about what happened during the French Revolution and World War II, its treasures and its most recent episode and turmoil. This tour is essential to know the birth of Paris and it is perfect for family with children. How long should I spend at Notre Dame? Plan on at least two hours if you plan to climb the towers. Make sure you cover your shoulders and have shorts or a skirt that go down at least to the knee (preferably longer). Popular solution: carry a light shawl or broad pashmina to wrap around bare shoudlers or serve as a makeshift skirt for going into chuches. There are free guided tours of Notre Dame, in English, Wednesday and Thursday at 2pm, Saturday at 2:30pm. Tours last about an hour and leave from under the great organ just inside the main doors to the church. Services—all in French—are held Sundays at 8:30am, 9:30am (Lauds), 10am (Gregorian chant), 11:30am (International mass, with some readings and prayers in English), 12:45pm, 5:45pm (Vespers), and 6:30pm (the biggie of the day, usually said by the Archbishop himself and broadcast live). Weekdays services are at 8am and 9am (in the choir; 9am mass suspended July–Aug) and again at noon and 6:15pm (at the main altar), plus a popular 5:45pm Vespers service. Saturdays there is a 5:45pm Vespers service and a 6:30pm mass. There's also a special Veneration of the Crown of thorns and the relics of the Passion on the first Friday of every month (every Friday during Lent) at 3pm.